The list of necessities for the perfect day can really be summed up something like this: good food, cold drinks, and the great outdoors. 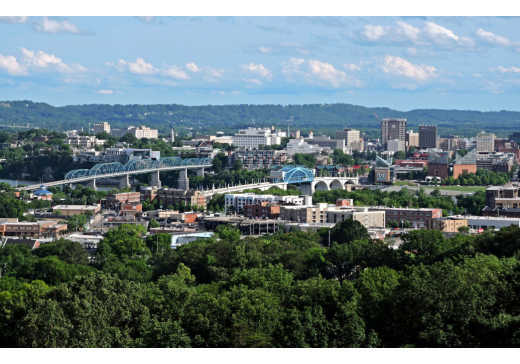 For all of these things, there’s really no question that Chattanooga’s Northshore neighborhood is the quintessential place to get all three. With multiple parks, dozens of bars and restaurants, and an exuberantly artsy culture, this unique neighborhood offers nonstop entertainment and days worth of excitement. We’ve put together a sample itinerary to get you started planning your Northshore experience. 7:30 a.m. : First thing’s first when you visit Chattanooga: Hit the trails. Stringer’s Ridge is one of the crowning jewels of the Northshore area, offering up about seven miles of interwoven trails just a couple of minutes from the riverfront. With a few paved paths and plenty of singletrack, the directional trails are popular for walking, running, and mountain biking. Stringers’ overlook platform is undoubtedly the best view of the Chattanooga skyline, and it is the perfect spot to watch the clouds roll off of Lookout Mountain in the early morning. From the main parking lot at Spears Avenue, consult the posted map to determine your optimal route. Take a quick dip into nature or create a multi-hour adventure, depending on your mood. With a variety of avian inhabitants, Stringer’s Ridge is a hub for local birdwatchers, and leashed pets are more than welcome. It’s proximity to downtown and the beautiful natural scenery make Stringer’s Ridge the absolute best place to start your day on Northshore. 9 a.m. : It’s safe to say that Northshore excels in the breakfast category, with more options than the pre-coffee mind can fully comprehend. One of the best cups of joe in Northshore is at Mean Mug’s new location, which serves locally roasted Velo coffee alongside award-winning homemade biscuits. For an indulgent post-trail treat, stop in at Julie Darling Donuts on your stroll through town. A variety of surprising flavors ensures that you’ll never have a run-of-the-mill breakfast at Julie Darling. Can’t decide? Here’s a tip: The sour cream cake donuts practically melt in your mouth. One of the most popular breakfast spots is Milk and Honey, a lively little eatery that’s cute, fresh, and 100 percent delicious. Stop in for espresso and a breakfast sandwich in the morning and come back later for a scoop of homemade gelato or a fresh handcrafted popsicle (or have gelato for breakfast—we won’t tell). 10 a.m. : Start your walking tour of Northshore at Renaissance Park on the riverfront. This wooded park has it all—eclectic outdoor sculptures, piers overlooking the water, picnic tables and, most importantly, a big grassy hill for cardboard sledding. From Renaissance Park, you can wind your way underneath the Market Street Bridge and find yourself in the neighboring Coolidge Park. With neatly mown lawns for picnics and frisbee throwing, Coolidge is manicured and perfect for some all-day grass lying and boat watching. Don’t miss the historic carousel, the sand-animal jungle gym, and the all-important sno-cone truck. Next, head on up to the Walnut Street Pedestrian Bridge for a bird’s-eye view of the Tennessee River and a one of a kind look at the Scenic City. Connecting Northshore to downtown, this iconic blue-trussed bridge is a favorite destination in Chattanooga and one of the most popular walking bridges in the world. 1 p.m. : For a quick bite to to eat, Good Dog is a locally owned hot-dog shop, with all-beef, natural casing hot dogs, veggie dogs, bratwurst, italian sausage, and chicken sausage. The restaurant features a funky decor (using re-purposed materials), and focuses on the belief that fast food can be fresh and local. You’ll find several different house-made ketchups and salad dressings, and Good Dog offers vegetarian and gluten-free options. Another one of Chattanooga’s most classic restaurants is the New York-style River Street Deli. The sandwiches are unique, unbeatable, and always a crowd pleaser. Feeling like you could go for a slice? Fiamma Pizza Co. will take care of all your wood-fired pizza needs. If you’re looking for some classic regional fare, slide on into Nikki’s Drive Inn for some deep fried southern deliciousness. 3 p.m. : After lunch is the perfect time to sidle down Frazier Avenue and visit the many unique shops and boutiques that make up the Northshore Merchants Collective. Blue Skies has regionally made jewelry and doodads, and it is the perfect place to find a gift for someone back home (or for yourself). For trendy clothing, accessories, and more, check out one of the boutiques like River City Apparel, Luxe, or Belle Rive. For the best extra-virgin olive oil from around the world, Olive Chattanooga is a fun place to explore, while the In-Town Gallery features a wide range of original artwork from more than 30 local artists. As you walk, keep an eye on the ground to learn some new dance moves: step-by-step instructions for jives like the Waltz and the Cha Cha are embedded into the sidewalk and promise to elicit giggles as you try to follow along. 7 p.m. : Dinner on Chattanooga’s Northshore is always a cultural experience. Visit Food Works, which is known for its bold flavors and extensive offerings. Grab a seat in the spacious upper dining room, which features high ceilings, exposed brick and ambient lighting. For sushi and more, Totto Sushi Bar and Grill offers the freshest sushi grade fish, some directly flown in from Japan. For a little bit of swank and a pour of Chattanooga Whiskey, do dinner and cocktails at Beast and Barrel. If you’re craving trendy Tex-Mex, Taco Mamacita is the place, and their Memphis Nachos are super shareable and crazy good. If you find yourself in the mood for something a little more laid back, try Edley’s BBQ, which features traditional barbecue cooked low and slow in an inviting atmosphere. The Brewhaus serves German-style food and beer and is always a favorite while Embargo 62 is your go-to for Cuban cuisine and dancing. End your fun-filled day with a sweet treat from Clumpies Ice Cream Co. You&apos;ll find a variety of hand-crafted ice cream flavors like Chocolate Chip Cookie Dough, Espresso Chocolate Chunk, and even a few seasonal scoops. Whether you plan out your itinerary hour by hour or opt to just wing it, you will find no shortage of entertainment, activities, and dining experiences awaiting you on your getaway to Northshore, and you’re sure to discover something new and exciting with each visit.